McCoy's Firehouse- A Full Service Bar and Grill! McCoy's Firehouse opened May 29th, 1998 in an old brick building erected in 1898, located in the heart of Seattle's Historic Pioneer Square District. The building has had a diverse and sometimes sorted past. It has been a hotel, a brothel and numerous restaurants and taverns in the last 120 years. You will no longer find the infamous women keeping the Klondike Gold Rush men company. However the building retains its original charm with pressed tin ceiling, brick walls and arched doorways providing a fun and interesting place to meet old friends and find new ones. 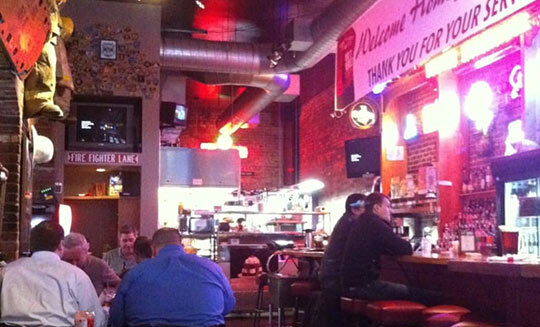 McCoy's is a full service Bar and Grill offering a mouthwatering array of food and libations. You will discover an ever-growing collection of firefighting and firefighters memorabilia, which includes turnout gear, hoses, helmets, brass, and old photos. McCoy's Firehouse has attracted guests from all over the world...check out the patches from fire departments from around the world. (Be sure to bring or send in your patch.) McCoys has become a regular watering hole for some of the finest firefighters this side of the Great Divide. © 2018, McCoy's Firehouse. All Rights Reserved.